Mayors Could Shift Nearly 42 Percent Of U.S. Electricity To Renewables By 2035 ... The U.S. withdrawal from the Paris Agreement is prompting more than 1,400 mayors to make their own pledges. POLITICS / CLIMATE CHANGE Mayors Could Shift Nearly 42 Percent Of U.S. Electricity To Renewables By 2035 ... The U.S. withdrawal from the Paris Agreement is prompting more than 1,400 mayors to make their own pledges. The country’s largest coalition of cities plans to vote this weekend on a pledge to make 100 percent renewable power a top policy priority over the next decade. The resolution by the U.S. Conference of Mayors ― who represent a 148 million people and 41.8 percent of the country’s electricity use ― would be the broadest rejection of President Donald Trump’s decision to withdraw the United States from the Paris climate agreement. If each of the federation’s 1,481 cities actually converted to zero-emissions electricity by 2035, U.S. emissions of planet-warming gases would fall by 619 million metric tons, according to a Sierra Club analysis shared exclusively with HuffPost. That’s equal to the total combined carbon footprint of the five worst states emitting greenhouse gases: Texas, Pennsylvania, Indiana, Florida and Ohio. The Paris Agreement, a pact signed by every nation except Syria and Nicaragua, set broad, non-binding targets for countries to reduce emissions of the greenhouse gases that cause the planet to warm and alter the climate. The U.S., historically the world’s biggest emitter, agreed to scale back pollution by 26 percent to 28 percent below 2005 levels by 2025. Trump announced plans to pull out of the deal this month after shredding virtually every policy meant to meet those goals. An alliance of more than 1,200 cities, counties, businesses and state leaders, led by billionaire and former New York City Mayor Michael Bloomberg, formed soon after, announcing plans to meet the Paris Agreement targets anyway. The group, called We Are Still In, includes some smaller municipalities than the U.S. Conference of Mayors, whose members have populations of at least 30,000. The Sierra Club outlined three potential scenarios for cities helping to reach the goals set by the Paris Agreement. 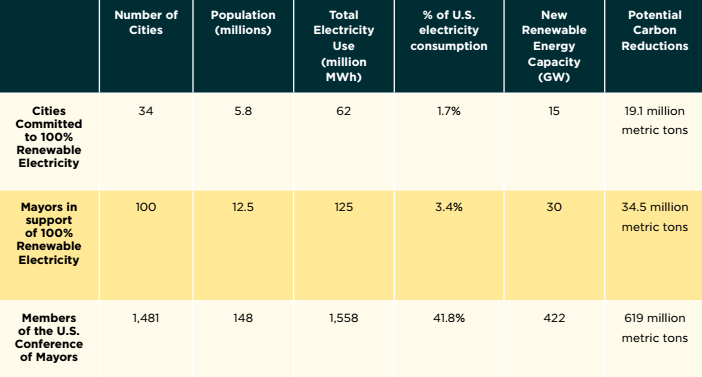 The Sierra Club analysis, based on data from the National Renewable Energy Laboratory and the U.S. Energy Information Administration, considered two additional scenarios. If the 34 cities who already have plans in place to transition to 100 percent clean energy achieve their goal, the U.S. emission from electricity would fall by 19.1 million metric tons. The number increases to 34.5 million metric tons, equal to 3.4 percent of U.S. electricity consumption, if an additional 84 cities whose mayors pledged to completely switch to renewables but have yet to pass a formal policy also meet their target. Of the 100 who committed to that promise, 16 already approved policies to convert their electricity supply to solar or wind. Getting the entire U.S. Conference of Mayors to adopt solar and wind power remains the ideal, if lofty, goal, Van Horn said. “This is the good, better, best scenario,” she said, referring to the three situations outlined in the report. The analysis comes just days after new research sparked fresh debate over the feasibility of converting to 100 percent renewable energy. The study, published Monday in the Proceedings of the National Academy of Sciences, warned that the costs of shifting the U.S. electricity grid to renewables by 2050, as Democratic senators proposed in April, could prompt a political backlash. Rather, Clack proposed policymakers should aim for a number closer to 80 percent renewable energy. That public discussion of clean energy has progressed at all to the percentage of renewable energy, rather than its merits compared to fossil fuels, struck Van Horn has a victory in itself. CLARIFICATION: This post was updated to include the official resolution’s deadline of 2035.